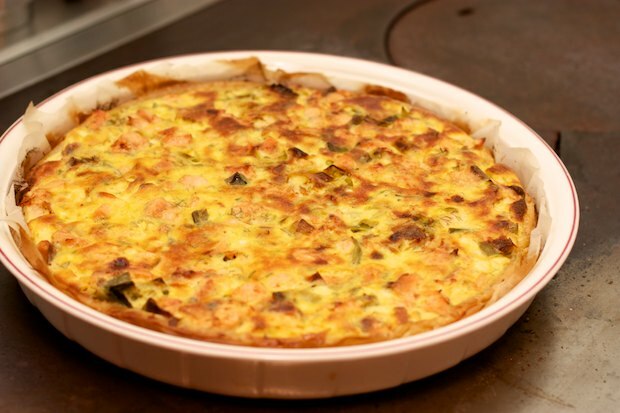 Legend has it that the “quiche” or pie according to the French actually derives from the German word “kuchen” i.e. a cake that could contain both sweet and savory items like cheese. It became famous thanks to a baker in 1500 from Nancy, France. Lorraine used a mixture of bread to make a case in which place cream custard and eggs. Subsequently, the dough was replaced by short cut pasty and then again into puff pastry, another French dough. The pies have spread throughout Europe and the world by bringing new adaptations to each ingredient from each place. This recipe is adapted from a quiche I tasted many years ago at the home of my friend from France named Chantal. At that time I had fun playing with recipes simply by trusting my sense of smell and knowledge of the ingredients. It happened so that the dishes I was making were very different from the original recipe. This salmon quiche can be used as the main course of a dinner or made in very small individual portions by closing the pastry into small crescents as a starter at a big dinner. In this case it is good to follow with a cream of vegetable soup to be easy on the diners. Cut the leek into wheels. Add the olive oil into a nonstick pan then add the leeks and a small spoon of water. Sauté slowly. Meanwhile, cut the salmon into strips depriving the skin and the central spine. Pour in the preparation of leek, raise the heat to high and pour in the vermouth. Let evaporate and continue cooking for 5 minutes. Turn off the burner and season with salt and pepper. In a bowl beat the eggs, add sour cream, and chopped the wild fennel. Add salt and pepper to taste. Place in a baking dish and pour the pastry over the salmon and then the cream mixture. Level with the back of a spoon. Insert in oven at 350F for about 35 minutes, until it forms a light golden crust. Posted in Eggs, Recipes. RSS 2.0 feed.